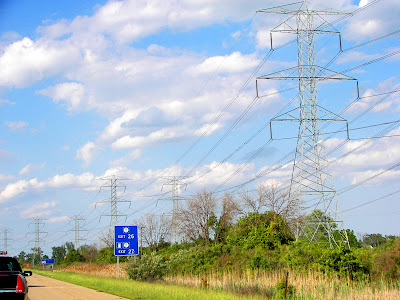 (Flat Rock, MI) AS I drove up I-75 in southeastern Michigan the other day, my eye gravitated toward the rows of utility towers carrying electricity from the Fermi II nuclear plant up to the Detroit area. For some reason the towers seemed like armed gunslingers marching along the roadside, as if their metallic arms were poised to draw and fire away at unseen adversaries. Of course, these would have to be six-armed gunslingers, given the number of steel appendages on the towers, but if you squint you might get the imagery I tried to convey.